With the holiday season coming upon us later this month we here at MARFC send out a “Very Merry Christmas” and a “Happy New Year” to all of our members across the state and country. May God Bless and keep us all safe throughout this holiday season. It has been a busy month and I am sure that with our gala banquet just about 6 weeks away it will get a lot busier. I look forward to seeing you all at the banquet. Remember to get your ticket order in by January 6, 2010 so you don’t miss out on any of the festivities. We had a great day at the Mt. Clemens Santa Parade and I will have pictures and details in next month’s update as well as pictures from Santa’s visit to the kids at our Kid’s Christmas Party. As I look back at the year that has passed us by so quickly I realize that in spite of the economy and the nation being at war, we here in Michigan were able to have a great racing season with many tight points battles at all of our tracks. I am thankful and grateful that we have the opportunity to go to so many different tracks to either race, watch the races, or just plain hang out. Thank You to all that have supported this club, our members, and the racing facilities. When I am asked what I would like for Christmas my response is this, Peace on Earth, Goodwill towards all, a great four car dash, and a full program of green, white, checkered flag racing. Seriously though, I wish you all good health, good cheer, and prosperity in the year ahead. As I promised last month, the recipient of the MARFC Presidents Award for 2009 is Legendary Drag Racer, Connie Kalitta. The Board of Directors chose Mr. Kalitta for his long and successful career in drag racing in the highly competitive NHRA as well as his contributions to the sport in nurturing and bringing forward some of the greatest talent in that arena. Connie has represented Michigan through his racing so very well and continues to do so today not only with the teams he campaigns but also through the contributions his company Kalitta Air makes in the world. I am excited to have him with us that night and to be able to present him with that award. As detailed last month, Mike Eddy will be receiving the Eddie Sachs Jr. Memorial Lifetime Achievement Award and George Keen will be receiving the MARFC Electronic Media Award. Now is the time to renew your membership for 2010. In order to save the club mailing costs we will be removing members who have not renewed as of our February newsletter so make sure you get your renewal in ASAP. Also remember that a MARFC membership or renewal makes a great Christmas gift to the race fan in your family. As always any questions or comments contact me via e-mail at president@marfc.org. It was found out that club member Kenny Handorf lost his Mother Barbara on November 12th. We here at MARFC pass along our prayers and condolences to Kenny and his family during this difficult time. The club held its November meeting at the Best Western in Birch Run on Sunday afternoon, November 8th. First up out of the box was Steve Puvalowski, the new owner of the legendary Tri-City Motor Speedway in Auburn, Michigan. Steve brought us up to date on the conditions of the Speedway as it sits right now and detailed his vision for the future. It will take a lot of work to get the track ready but Steve has what sounds like a good plan and a good amount of support from the racing community. Steve hopes to have a couple of shows in late 2010 and knows that it will take some good hard work to get the Trick Track back in shape. Early indications are that Tri-City will remain as a dirt track but don’t put the idea of the resurrection of the 1/2 mile 5 turner away just yet. Next up was longtime campaigner and 2003 Michigan Motor Sports Hall of Fame inductee, Jay Woolworth. Jay is a wealth of information and stories from his long career and that is what he shared with us. He also shared about the Championship that his grand-son Jake Thompson won at Auto City this season in the Hornets Division. In this sport it is pretty common to see a father and son race at the same track but to see a grandfather and grandson is truly remarkable and just goes to show the family atmosphere in our great sport as it is today. The trio of Inloes, Prieur, and Darling came out of the box after Jay. Our friend Larry Loynes was slated to be with us but that oinky flu got in the way. Big Ed gave us a rundown of the happenings at both the Auto City Speedway and the Spartan Speedway. 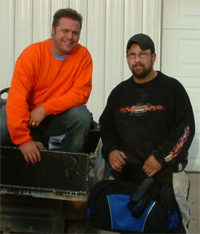 Both tracks have an aggressive schedule in the works and are fast at work on the 2010 season as well as the new grandstands and press box being constructed at Spartan Speedway. Matt “Hollywood” Prieur gave us the rundown on what is going on with the Owosso and Dixie Speedways for the coming year as well as a recap of the 2009 seasons at both of these fine speedways. Finally, the third member of the trio, Chuck “The Flounder” Darling spoke about the Michigan Short Track Racing Club (MSTRC) and how it got started and evolved to where it is today. Chuck spoke of the many opportunities he has had over the years by his association with the MSTRC and spoke of the many friendships he has made with fans, drivers, promoters and many in racing. This led into the trio speaking about the upcoming MSTRC Bowling tournament held in Owosso in February. This is a fundraiser that benefits people in the racing community that have suffered setbacks and need a hand up. More on this very worthwhile event in later editions of the MARFC Messenger but while you are waiting lets think about getting a few teams together for the tournament. If you are interested please give me a call. To close things up for the day, Dixie/Owosso Promoter Jeff Parish made a few comments and updates to what Hollywood shared about and Joe DeWitte of the Auto City Speedway spoke about his experiences in race promotion/track ownership and let us know about a couple of special shows coming up in 2010 at Auto City. More on these at Joe release details. Julie DeHem won the 50/50 drawing and donated it to the Kid’s Christmas Party, Thank You Julie and Thank You to Steve Puvalowski, Jay Woolworth, Ed Inloes, Matt Prieur, Chuck Darling, Jeff and Pam Parish, and Joe DeWitte. We will definitely keep this annual tradition of a November meeting in Birch Run. As we move into the holiday season I am once again reminded of how thankful I am for this great country we live in and the freedoms that it allows us. I am grateful that we are able to enjoy and take part in this great sport of automobile racing. Whether we are a NASCAR fan, a short track fan, an open wheel fan, and whether we like road courses, drag racing, or oval tracks we are all bound together by the thrill, the sights, the sounds, the smells, and the atmosphere found at any of the many racing venues we have access to. I am also very thankful to all of our members, our member tracks, and all of our supporters that keep this great club moving forward. Take the time to be safe this winter and also to enjoy those around you for the upcoming Thanksgiving Holiday. I apologize for the lag in putting up some new information on the website but I said last month that we would leave the stuff up a bit longer and that is what we did. The Annual MARFC Awards Banquet and Dinner Dance is coming up so mark your calendars for January 16, 2010 so you don’t miss it. Tickets will go on sale at the end of October but you can reserve yours now by e-mailing me at president@marfc.org. As in the past tickets can be purchased for a donation of $39.00 each and include dinner, open bar, awards presentation, door prizes, and dancing. No tickets will be sold at the door. At present we have selected our top award recipients for this year and George Keen will be receiving the Electronic Media Award for his show and website entitled “The Racing Show”. George has made many contributions to Michigan Auto Racing over the years and his endeavors with “The Racing Show” have been keeping many of our Western and Mid-Michigan racers and fans abreast of all the happenings and goings on in the racing world. 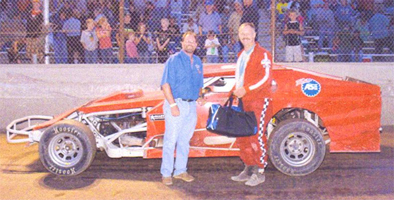 Mike Eddy has been selected to receive the Eddie Sachs Jr. Memorial Lifetime Achievement Award in recognition of his stellar career not only in the ASA and ARTGO races of days gone by but also or the many race wins, championships, and great talent He has shown over the years in regular weekly racing all over the State of Michigan as well as the mid-west and parts south. I will update you all on the recipient of the President’s Award as we have not been able to contact the winner as of press time and we don’t want to surprise them on the internet. We have learned that longtime MARFC member and Michigan Motor Sports Hall of Fame inductee, Gordy Vanderlaan passed away on October 17, 2009. We pass along our condolences to Gordy’s family and wish him God Speed, Thanks for the memories Gordy. Our fan club days for 2009 are in the record books but many of our members took advantage of the $5.00 discount to club members at the recent “Glass City 200” at the Toledo Speedway. Thanks again to Ron Drager, Roy Mott, Scott Schultz, and the staff at the Toledo Speedway for providing this opportunity. It was a great day of racing even though Mother Nature tried to dampen things but the Toledo Speedway staff kept the show going and ended it with green flag racing right up to the checkered flag. Our first monthly meeting of the winter season was held on October 17th at the Kart 2 Kart indoor karting center. Club President, Dave DeHem gave a rundown of the past summer’s events and an update on what is coming up over the winter and into the spring. The winners of our annual raffle were drawn from the barrel and this year’s top prize winner of $300 was Jeff Moroni, Sharon Evans took second prize of $150, while Donna Darrow took home the $100 third prize. Steve Stein was the 50/50 winner and donated it back to the club for the Kid’s Christmas Party. Thank You Steve! Sue Ginter was the door prize winner. Many thanks to the staff and owners of Kart 2 Kart for having us out as well as longtime supporter and club member Bob Capps for getting the meeting set-up for us. Our November meeting will be on Sunday afternoon, November 8th at the Best Western in Birch Run. The Hotel is located just off of I-75 at exit 136. The meeting gets the green flag at 2:30 PM. We here at MARFC are deeply saddened at the loss of club member “Big Mike” Willhite. Mike was the crew chief for the #71 Auto City Super Stock driven by Terry Bogusz Jr. Mike was a friend to all he met both on and off the track. We send our condolences to Mike’s family, the Fast Company Racing Team, and to the many friends Mike has made over the years.